Helpful Hints for Better Aseptic Technique | Bionique® Testing Laboratories, Inc. Cell culture contamination is very difficult to avoid entirely, especially in a busy laboratory. 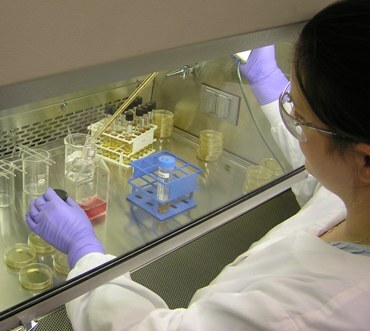 However, careful aseptic technique, appropriate caution and training can significantly reduce the risk of contamination within your cell culture facility. All personnel should receive training and demonstrate proficiency in the laboratory practices for conducting and supporting sterile procedures and facility safeguards. Education and technical training programs need to be ongoing endeavors to ensure the quality of work in the long term (Coecke; 2007). Additionally, aseptic technique must be supported by good laboratory design, selection of proper equipment and facility safeguards to protect laboratory workers and to reliably achieve successful sterile manipulation and processing of cell cultures. Bionique is here to help, please feel free to contact the labratory with any questions. And, most importantly, the technician and coworkers. This is especially true when working with human cell lines known to contain oncogenic or infectious viruses or other harmful microorganisms (Barkley, 1979; Coecke et al., 2005). The degree of rigor used in these behaviors and actions should be related to the value of your cell cultures and their applications, whether for research or bioproduction (Bionique Testing Laboratories, Inc.; FAQ: How can I avoid mycoplasma contamination and other serious cell culture problems?,2009). 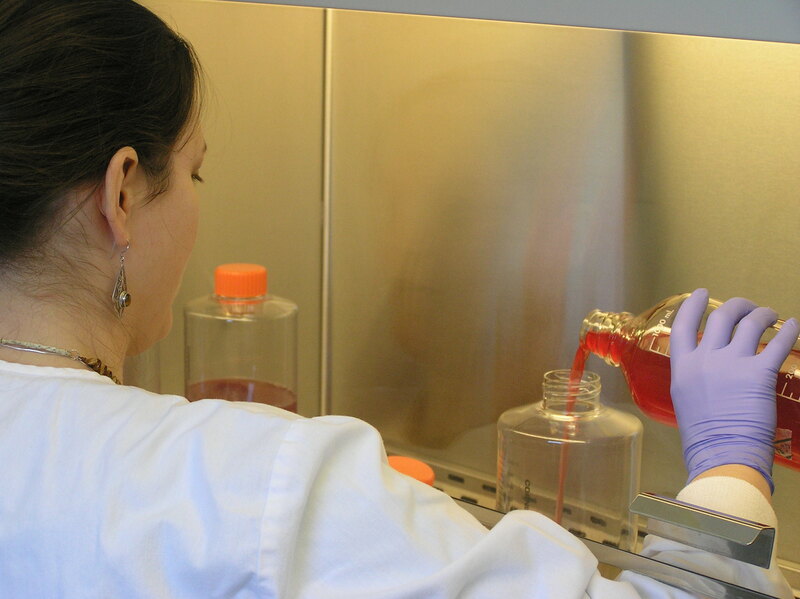 How much time, money and effort were spent to develop or obtain your cell culture? Many widely used cell lines can be purchased for a few hundred dollars per vial. However, specialized and genetically engineered cultures used for the production of monoclonal antibodies, recombinant therapeutic proteins and vaccines come with significant costs, exceeding thousands of dollars. How difficult will it be to replace the culture or repeat the experiment or production run? Some cultures, such as hybridomas, may be truly irreplaceable. What are the consequences to your research, laboratory/facility and career if important cultures become contaminated with mycoplasmas or are lost due to other causes, such as an accident or cross contamination by another cell line (Buehring et al., 2004)? Sometimes, researchers discover their cells lines are contaminated with mycoplasmas only after they send their cell lines to other researchers who then discover the contamination with testing. Developing successful aseptic techniques requires specific training and a clear understanding of the nature, types and potential sources of contamination. Freshney (2005) and Ryan (2008a) provide good information on these critical areas. The following recommendations are designed to help improve your aseptic techniques and to preserve the integrity of your cell cultures. First and foremost, all supplies and reagents that come into contact with the cultures must be sterile (Phelan, 2007). Wash hands before and after handling any cell culture. Hand washing stations should be readily accessible within the laboratory. Handle only one cell line at a time. There are intrinsic risks of misidentification or cross contamination between cell cultures when more than one cell line is in use within the laboratory (Freshney, 2006). Handle continuous cell lines after the handling of short-term, finite cell cultures. Quarantine and handle under strict precautions all incoming cell lines until testing concludes the absence of mycoplasma. Alternatively, purchase cell lines from repositories which certify that materials are mycoplasma-free prior to distribution. Avoid continuous long-term use of antibiotics within cell cultures. The overuse of antibiotics as prophylaxis may lead to cytotoxicity and pose an increased risk of covert mycoplasma contamination within the cell lines. For further information on this important topic, please refer to FAQ: Why does overuse of antibiotics result in higher mycoplasma contamination rates? Cultures should be inspected daily for signs of contamination. In addition, testing at regular intervals for mycoplasma should be conducted to ensure the purity and integrity of the culture. Promptly discard any contaminated cultures. Retention of these cultures poses a serious threat of cross contamination to other cultures in the laboratory. If clean-up of the contaminated culture is attempted, then any work with this culture should be reserved to the very end of the day to minimize transfer of the contamination. Divide sterile solutions into small aliquots whenever possible. For instance, trypsin should be dispensed in single use quantities of 5 to 10 mL/tube. Ideally, reagents should be prepared in sufficient amounts to only meet the requirements for the number of samples that are being processed. Solutions which are left over should be discarded rather than reused. This reduces the chances for contamination and minimizes the consequences, if it does occur. Always use separate media bottles for every cell line. This important step reduces both the possibility of cross contamination with another cell line and limits the spread of contamination if the bottle of medium becomes contaminated. Avoid sharing bottles of media or other solutions with coworkers. Cross contamination and lack of accountability arise from sharing with others. Do not use the same pipette with different cell lines (Freshney, 2006). Never insert a pipette back into a bottle of medium after it has been used to feed a culture. This "double pipetting" saves on pipettes but can easily lead to widespread contamination by other cell lines or mycoplasma. Do not insert the non-sterile portion of adjustable pipettors into vessels containing cells or sterile solutions; it is not worth the risk of contamination. Use filtered pipette tips for aseptic transfers. Using unfiltered pipette tips to transfer cells or medium can result in contamination of the pipetting device and subsequent pipette tips. Never mouth pipette, even when nonhazardous substances are being transferred. Using a pipetting aid not only protects personnel but also reduces the risk of mycoplasma contamination of cultures with M. orale and M. salivarium. Figure 1 - Pouring is a risky means of transferring fluids. Try to find safer, more aseptic alternatives such as pumping. Avoid pouring sterile liquids from one vessel into another (Figure 1). The drop of liquid that usually remains on the lip of the vessel can easily form a liquid bridge between the nonsterile outside and sterile inside of the vessel. This allows microorganisms from the outside to enter and contaminate the vessel and its contents, especially when pouring a second time. Pouring also increases the possibility of aerosol formation (Caputo, 1988). If pouring must be done, remove any liquid from the threads with a sterile alcohol wipes or gauze pads. Avoid spills or liquid bridges on the lips of dishes, bottles and flasks. They provide an easy access point for microorganisms into the vessel. Replace the caps of flasks that have wet threads or wipe dry with sterile alcohol wipes. Clean up any spills immediately and swab area with suitable disinfectants. Biological safety cabinets and laminar flow hoods provide containment and protection for the personnel, environment and cell cultures or products from biohazards and cross contamination during routine procedures. Many different types and classification of safety cabinets and hoods exist to meet the specific needs of any cell culture laboratory. Product selection will depend on the nature of the cell culture work and the biosafety level of the materials being used and processed. Horizontal laminar flow hoods should not be used for cell culture procedures. These biosafety hoods are designed to protect the work area only; air flow, and any contaminants it contains, is directed towards the operator (Coecke; 2005). Biosafety guidelines and classifications of all human and zoonotic pathogenic agents have been established and published by the U.S. Department of Health and Human Services, Center for Disease Control and Prevention (CDC) and National Institutes of Health (NIH) in the Manual of Biosafety in Microbiological and Biomedical Laboratories (BMBL),5th Edition; 2007 ( http://www.cdc.gov/od/ohs/biosfty/bmbl5/BMBL_5th_Edition.pdf ). Figure 2 - Correct aseptic technique is critical for avoiding contamination problems (Coecke et al., 2005). The nonprofit Eagleson Institute (http://www.eagleson.org) offers a variety of training programs on biosafety cabinet technology and use. Always have the biosafety cabinets certified at the time of installment and recertify if moved or repaired. It is also recommended to routinely test the quality of the airflow and filter integrity every 6 to 12 months. Biosafety cabinets may be equipped with germicidal UV lights for decontaminating work surfaces. However, the efficacy of UV lamps has been challenged. The UV light rays must directly strike a microorganism in order to destroy it. Over time, the UV output and germicidal capacity from the tube diminishes. Finally, there are safety concerns related to the exposure to UV light (Phelan, 2007). UV exposure is damaging to the eyes and skin, therefore, the UV light should never be on while the cabinet is in use. Biosafety cabinets and hoods should be turned on 15 minutes prior to use each day. Alternatively, keep hoods running 24 hours a day during the work week. Work surfaces should be wiped down with 70% ethanol, or other suitable disinfectant, before and after each use and between cell lines. Never use a flammable disinfectant, such as alcohol, if an open flame is in use nearby. Wipe down bottles and flasks with 70% ethanol or other suitable disinfectant before being placed in the cabinet. Wear a clean lab coat when working in a hood. This coat should be for hood use only and not be worn anywhere else in the laboratory. Limit people access to area around the hood while working. This reduces levels of airborne contaminants, unnecessary distractions and talking. Avoid unnecessary talking while working in the hood. Talking generates microbial laden aerosols that can then enter into the hood. Consider wearing a mask if talking is necessary or if you have a cold. Avoid moving materials in or out of the hood while work is in progress. Keep the hood work area clean and uncluttered. Do not use hoods as storage cabinets. Clutter makes it very difficult to clean the work surface properly and can disrupt the laminar flow around the work area. Do not use open flames, especially Bunsen burners, in laminar flow hoods. The heat plume from the flame will disrupt the moving curtain of filtered air provided by the hood and increase the risk of contamination. It is also a major safety issue. Serious hood explosions, fires and injuries have resulted from gas leaking from Bunsen burners or an open flame igniting alcohol used as a disinfectant. Doors in the culture area should be kept closed while hood is in use. Opening a door can create a back draft and disrupts laminar flow in hoods. Consider replacing traditional doors with sliding doors to eliminate this problem, especially in heavy traffic areas. Minimize transport distances and avoid using common hallways to reduce contact with airborne contaminants. Ideally, incubators should be placed in close proximity to the culture area to restrict the movement of cells within the facility. Contamination resulting from transport is far more likely in unsealed vessels, such as dishes and microplates, than in flasks. Use flasks with vented caps whenever possible, especially for long-term cultures. Transport and incubate unsealed vessels, such as dishes and microplates, in plastic boxes or trays. 240 mm square culture dishes can be used as trays for 96 well plates and smaller dishes; 150 mm dishes can accommodate 35 mm dishes. Wear clean lab coats; for additional protection in the hood use a fresh, closed front lab coat with gloves that overlap the cuffs. Protective eyewear should be used when appropriate. Lab coats used for cell culture should not leave the cell culture area. Consider wearing clean gloves during aseptic procedures. Flakes of dry skin are loaded with bacteria. The gloves provide a measure of personal protection as well. Caution should be taken when handling sharp instruments such as needles, scalpels, scissors and glass pipettes. Sterile disposable plastic supplies should be preferentially used to avoid the risk of broken or splintered glass (Phelan, 2007). Hair, especially when it is long, attracts dust and provides a potential source of contamination. Consider tying it back or using a hair cover or cap. Be careful doing cell culture after baking or brewing with yeast. Even after thorough washing and a change of clothing, home bakers and brewers sometimes shed substantial quantities of yeast for at least a day or two later. Ideally, cell and tissue culture should be conducted in a specifically designated room which has minimal traffic. Since microorganisms attach to dust particles, reducing the amount of dust and dirt in the culture area is always a priority. Do not open windows or use window fans that allow in outside air. If possible, cover incoming air vents with HEPA filters. Wash floors and bench tops frequently with an appropriate disinfectant. Sticky mats placed on the floor outside the entry to culture room can also reduce the amount of dirt carried inside. Frequently clean water baths used for warming media or solutions. Better yet, avoid water baths entirely by using an incubator room or a bath filled with metal beads for warming media and solutions. Wetting the outside of a bottle with contaminated water before bringing it into a hood is never a good idea. Periodically empty and carefully clean incubators (Figure 3). Use cleaning agents that do not leave residues or corrode the metal interior or shelves. Never use metal cleaners that contain waxes. Figure 3 - Incubators are a potential source of contamination. Incubators should be emptied and cleaned at regular intervals to reduce the circulation of microorganisms (Freshney; 2005). Use a pest management program to keep rodents and insects, such as flies, ants or cockroaches, under control. Insects can enter opened packages of sterile products. There have been reported instances of insects found inside incubators. Also, plants should always be kept out of the culture area. They attract insects and their soil is a rich source of contamination. When possible, avoid placing refrigerators in the culture area, especially near safety cabinets. Their external condenser cooling coils collect dust particles which then get carried into the room during the cooling cycle. Vacuum cleaning the coils several times a year will reduce the problem and allow them to run more efficiently. Barkley, W. E. Safety Considerations in the Cell Culture Laboratory. in Methods in Enzymology: Cell Culture, Vol. 58. W. B. Jacoby and I. H. Pastan, eds. (Academic Press, New York, 1979) p. 36-44. Bionique Testing Laboratories, Inc. FAQ: How can I avoid mycoplasma contamination and other serious cell culture problems? 2009. Bionique Testing Laboratories, Inc. FAQ: Why does overuse of antibiotics result in higher mycoplasma contamination rates? 2009. Buehring, G. C., Eby, E. A., Eby M. J. Cell Line Cross-Contamination: How Aware are Mammalian Cell Culturists of the Problem and How to Monitor It? In Vitro Cell Dev Biol Anim. 40(7):211-5 (2004). Caputo, J.L. Biosafety Procedures in Cell Culture. J. Tissue Cult. Methods 11(4): 223-227 (1988). Coecke, S. et al. Guidance on Good Cell Culture Practice. ATLA 33:261-287 (2005). Crueger, W. Sterile Techniques in Biotechnology; In Biotechnology Focus 2, (Hanser Publishers, Munich, 1990) p. 393. Freshney, R.I. Basic Principles of Cell Culture; In Culture of Cells for Tissue Engineering, Ch. 1 eds. (John Wiley & Sons, Hoboken, NJ, 2006). Freshney, R.I. Cell Line Provenance. Cytotechnology 39:55-67 (2002). Freshney, R. I. Culture of Animal Cells: A Manual of Basic Technique. (Fourth edition; Wiley-Liss, New York, 2000) Chapters 5, 8, 12 and 18. Freshney, R.I. Culture of Animal Cells: A Manual of Basic Technique, 5th Ed. John Wiley & Sons. Hoboken NJ, 2005). McGarrity, G. J. Spread and Control of Mycoplasmal Infection of Cell Cultures. In Vitro 12:643-647 (1976). Perlman, D. Use of Antibiotics in Cell Culture Media. in Methods in Enzymology: Cell Culture, Vol. 58, W. B. Jacoby and I. H. Pasten, eds. (Academic Press, New York, 1979) p. 110-116. Phelan, M.C. 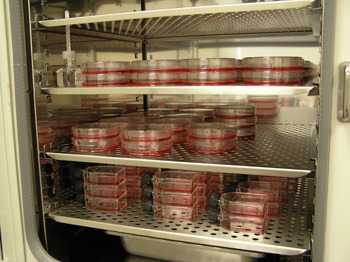 Basic Techniques in Mammalian Cell Tissue Culture. Curr. Protoc. Cell Biol. 1.1.1 - 1.1.18 (September 2007). Ryan, J. A. Understanding and Managing Cell Culture Contamination. Corning, Inc. Technical Bulletin CLS-AN-020 REV2 (2008a; Available in the Technical Document Library on the Corning Life Sciences web site at www.corning.com/lifesciences). U.S. Department of Health and Human Services, Center for Disease Control and Prevention and National Institutes of Health. Biosafety in Microbiological and Biomedical Laboratories, 5th Edition, U.S. Government Printing Office, Washington, D.C.; 2007. Wolf, K. Laboratory Management of Cell Cultures. in Methods in Enzymology: Cell Culture, Vol. 58, W. B. Jacoby and I. H. Pasten, eds. (Academic Press, New York, 1979) p. 116-119.